It’s Sunday evening, you’ve just eaten that delicious home-cooked meal for dinner and each of your loved ones are well-fed and satisfied. But, your kitchen looks as though it has seen better days. Pans are piled high in the sink and there’s an overwhelming pile of dirty plates cluttering your worktop, demanding your attention. If only you had a dishwasher to help, so that you could rest easy and avoid the next few hours of handwashing. “My kitchen is too small”, “Sadly, I don’t have enough room to install one” we hear you say. But what if we told you that there was a solution for all households, in the form of an unobtrusive but technologically advanced slimline dishwasher. Just because your kitchen is modest in size doesn’t necessarily mean you want to spend your well-earned free time washing up those dishes you’ve used. 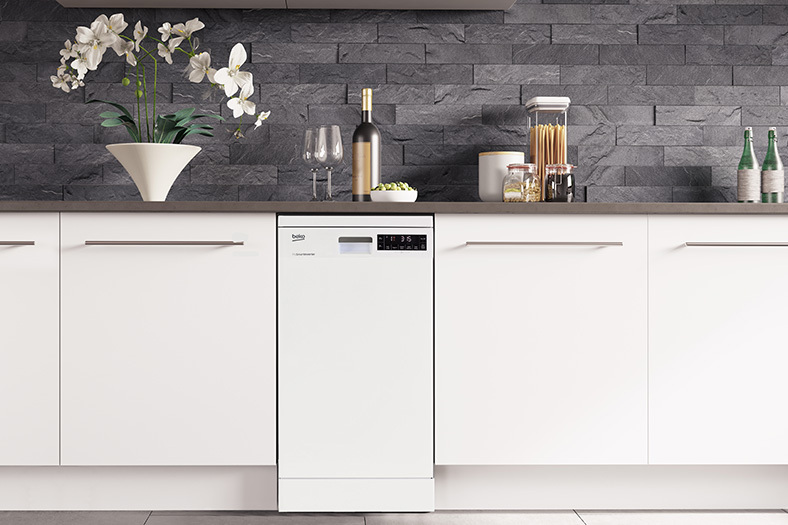 A slimline dishwasher is not just designed for smaller households; they also offer great technologies and features without having to compromise on cleaning performance. We pulled together some of the reasons why a slimline dishwasher is designed for and could benefit all households: big or small. 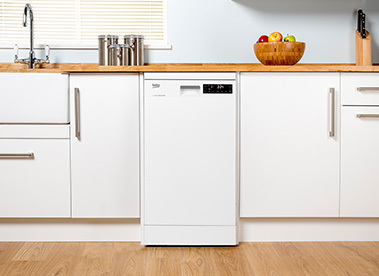 A slimline dishwasher is the perfect appliance to place comfortably into your kitchen if space is tight. Not only does a slimline dishwasher maximise the kitchen space you already have, it also is a helpful space-saving solution that frees up more space by keeping your kitchen surfaces clear. You can sit back and relax whilst your dishwasher does the hard work washing your pots and pans, enjoying your crockery-free kitchen in the meantime. Out of sight and out of mind? Now that’s what we call a win/win. Just because slimline dishwashers are smaller on the outside when compared to their full size counterparts, doesn’t mean that inside storage space is limited. 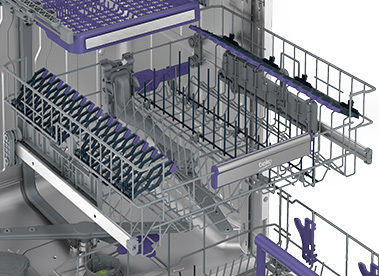 With an easy load upper basket and removable cutlery basket, you can effectively load the dishwasher your way. You can even wash up to 10 place settings’ worth of crockery in one cycle. 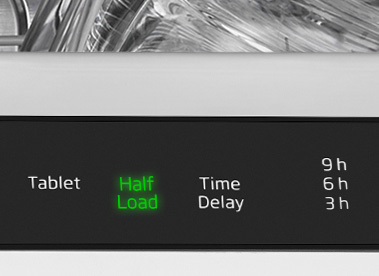 So not only is a slimline dishwasher a small and stylish solution to all your cleaning needs, it’s designed to suit you throughout your daily life; on full load days and half load days. It is not just smaller kitchens that would benefit from installing a slimline model. A slimline dishwasher is perfect in busy family homes where the need for a dishwasher is high but floor space is held for other priorities. Living in a house share or own a property? A slimline dishwasher is the perfect kitchen appliance that won’t take up a lot of floor space but will help keep the washing up more manageable. 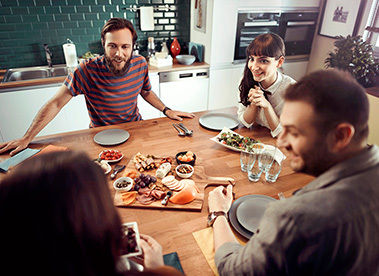 So whether your home is modest in size or pretty sizable, you needn’t dread the washing up after hosting a dinner party or cooking for a big group ever again. And they’re great value too! 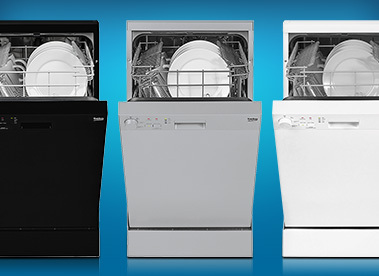 Check out our range of slimline dishwashers here. Choosing a slimline dishwasher does not just save space in your house, it also helps you do your bit for the environment too. The models rated A+ to A++ for energy efficiency keep your crockery sparkly clean – saving you money on your energy bills. Beko slimline dishwashers also offer a half load function, which adjusts the amount of water and energy used when a half load is used. With this programme you can reduce your energy and water consumption by 10-25%. Beko’s slimline dishwashers come with a host of technologies and time-saving features to help make life easier around the home. 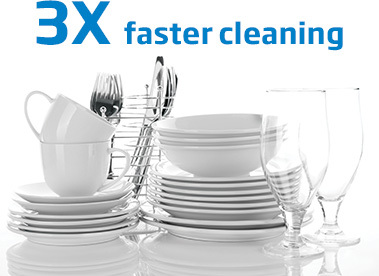 On days where you need to get a full load of dishes clean with haste, the Mini 30 programme takes just 30 minutes to wash a full lightly soiled load of dishes and a full load in just 58 minutes with the Quick and Clean function. Through the use of variable speed technology by the ProSmart Inverter Motor and higher water temperature, the fast+ technology available on selected models shortens the programmes by up to 70% – perfect on those days when you’re in a hurry. Beko’s slimline dishwashers come in a range of colours to suit your kitchen’s décor. Because we know that every kitchen is different, you can choose a freestanding or integrated slimline dishwasher to suit your home. Integrated dishwashers are designed to fit in with your kitchen’s decoration seamlessly, while freestanding slimline dishwashers can be placed comfortably into your kitchen beside your other appliances and worktops. Finally, Beko freestanding slimline dishwashers come in silver, black, and classic white, so whatever the style and decoration of your kitchen, there’s a model to suit your home perfectly. Whether you’re looking for a helping hand for the washing up after mealtimes or looking to add in a dishwasher to make your kitchen cleaner and feel bigger, we have a model with high performance technology to suit you. Still looking for more inspiration? Take a look at our 10 simple reasons to buy a dishwasher for more details on how a dishwasher could benefit your home.